A Subaru Impreza slid sideways out of their lane into an oncoming Yukon at the BE/Cache border (Courtesy: Utah Highway Patrol). LOGAN — A two-vehicle crash Friday morning sent two people to the hospital in serious condition and partially closed Sardine Canyon for several hours. The collision occurred at 9 a.m. near the summit of US-89/91. 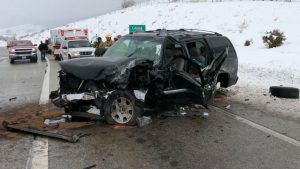 Utah Highway Patrol Lt. Lee Perry said Caitlin Nolan was driving a Subaru Impreza southbound when she lost control and slid into oncoming traffic. The car was broadsided by a GMC Yukon, driven Guillermo Valencia-Zaragoza, a 45-year-old Ogden man. Nolan was not wearing a seat belt and was thrown into the back seat of the Impreza. She was taken to Brigham City Community Hospital and later transferred to Ogden Regional in serious but stable condition with a neck injury. GMC Yukon that broadsided a Subaru Impreza near the summit of Sardine Canyon, US-89/91 (Courtesy: Utah Highway Patrol). Valencia was wearing a seat belt and had to be extricated from the Yukon by emergency crews. He was transported to Logan Regional Hospital in good condition with likely broken bones and abrasions. Perry said it appears that Nolan was driving too fast for the snowy conditions at the time of the crash. Troopers closed northbound traffic for about 45 minutes while Valencia was extricated. Southbound traffic was also reduced to one lane for more than two hours. Perry said Nolan faces possible citations, pending the completion of the investigation. Friday’s crash came three days after a Hyde Park woman was killed near the same location. Bonnie Joy Reeder was the passenger in a gray pickup truck, reportedly driving the wrong way in the southbound lane.